"I've often wondered if humans were doomed to a dead end branch of the evolutionary tree, considering our reckless treatment of our planet and everything on it . . . It's time we did learn a thing or two from the animals with whom we share this planet; they are certainly wiser in many ways – as shown by Ralph and his comrades in this humorous novel. This book has all the elements of a good story, combined with a great cause that does not hinder the plot with "preachiness"! A keen mastery of written prose and of human psychology shines in this visionary tale recounted by Stephen Wing. This story is witty, fun, and meaningful. Hail to Ralph!" "Free Ralph! An Evolutionary Fable is deftly written and highly recommended for community library collections and for anyone who wants a good laugh that will make them think at the same time." Midwest Book Review, "The Humor Shelf"
"Free Ralph! kept me interested and wanting to know what was going to happen. I loved the characters and your way of meshing the story with ideas about evolution and interspecies connection." “Free Ralph! moves smoothly and develops dramatic tension well . . . A touching and deep story with profound implications about how we live our lives here on this Earth." "It's the best book I've read in years! Good stuff! Can't wait for the movie version . . ."
and it’s time for our next step! Ages ago, deep in the African jungle, our human ancestors split off from the bloodline that would evolve into our cousin the chimpanzee. Ever since, homo sapiens has been busy evolving an intelligence and culture far superior to those of our wild relatives. In this gently humorous, thought-provoking novel, as the ecological impact of human “intelligence and culture” grows increasingly clear, the evolutionary paths of chimps and humans are about to converge once more, millions of years after we parted ways! is a circus chimp, kidnapped in infancy from his family in Central Africa, who now performs on the trapeze under the stage name “Ralph” . . .
is an American janitor, fulfilling his lifelong dream of an African safari, who gets lost in the jungle one night and rescued by a family of chimps . . .
. . . who happen to be Kumbu’s relatives. When the chimpanzees discover that through a rare evolutionary mutation Wilbur bears “The Gift” – the ability to communicate telepathically, as they do – they commission him to rescue Kumbu from the circus, and the evolution of both species takes a quantum jump forward. Evolution may never be the same! Can We Measure Consciousness? Yes We Can! "There's Always a Next Step"
Only One Person Can Save the World . . . And It's Not Barack Obama! Out of Sight, Out of Mind, and Good Riddance! "Here's a book you'll want to tell your friends about, just to see the delight on their faces. Stephen Wing has written a comic epic in the tradition of Cervantes and Kurt Vonnegut . . . An utterly convincing philosophy of evolutionary ecology is the deepest layer of this profound and hilarious book." "Free Ralph! is an expertly crafted novel. Like practiced trapeze artists, the subplots soar towards one another across a seemingly unbridgeable chasm; there is a moment of breathless suspense before their fingers wrap securely around one another's wrists. The innocent, excitable chimp protagonist is the most lovable fictional character I can think of. I could hardly put the book down, except to laugh at its jokes." "[This] delightful novel . . . tickles as it imparts deep truths and wisdom." Alim Thompson, CEO, New Leaf Distributing Co.
"This fable reminds us that all species are connected, and what happens to one inevitably affects the others. Wing explores the concept of conscious evolution, the notion that with all the power humans possess over the planet, we must take care to treat it and other species ethically." "There is a great passage in Free Ralph! 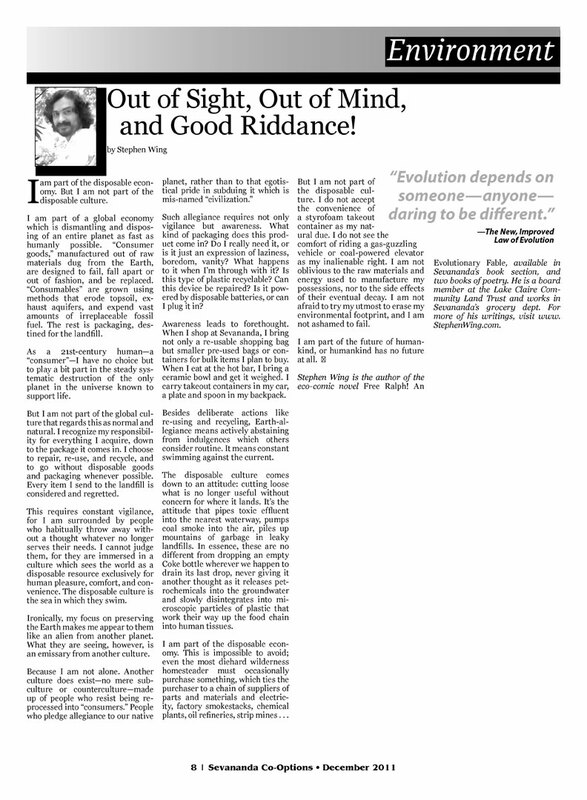 in which the Ape Sage, Guma, adroitly addresses God, evolution, and theodicy. In three pages, he covers all the important issues of philosophy. Guma outlines the serious content of your book without descending into boring professional monologue. Even when the book is at its funniest, it somehow retains its serious-as-hell core. Not an easy circus act to follow!" "Good work, sir: it's smart, funny, and moving, and you manage the rather difficult business of juggling the different characters, plots, and settings so that the reader enjoys variety without confusion." "Free Ralph! deftly weaves multiple story lines which culminate in an exciting, satisfying end. One of the sweet surprises of the book is the unfolding of an unexpected mother/daughter tale in all its richness and complexities. As the daughter of a mother whom I am nothing at all like and whom I am everything like, I had special appreciation for this. Part of the wisdom and wholistic viewpoint of the story is that this contradiction is seen in its most positive and hopeful light."